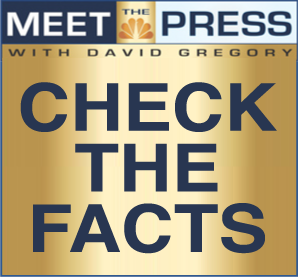 Meet the Facts is a non-partisan grassroots effort to encourage the NBC television program Meet the Press to incorporate a formal fact-checking procedure for all statements made on air by its guests. That analysis would then be released to the public, preferably within several days of the broadcast. We’d love your help as well! This campaign is not about attacking Meet the Press or its staff, but rather about holding the program/brand to a higher standard – one that at present it is not itself meeting. Furthermore, we think “Meet the Facts” is a pretty catchy name. If NBC News and the staff of Meet the Press agree to permanently institute a public fact-checking system for everything guests say on the air, we think they should absolutely name that feature “Meet the Facts” and we will gladly transfer over the domain name, Twitter username, and Facebook page username for their use, and at no cost. We look forward to a time when If It’s Sunday It’s Meet the Press – but politicians beware, come Monday It’s Meet the Facts. In the meantime, we will try to do the job NBC and Meet the Press so far refuse to do, and fact-check its guests. This effort is coordinated by a political science student in Kansas (Paul Breer) and a journalism student in NYC (Chas Danner). We and this campaign are not affiliated with any organization. Although we are both Democrats (yes they have those in Kansas) – that does not and will not impact this non-partisan effort in any way. Arguments based on facts are beneficial to every ideology. We have invested $20 (domain names) and some hard work. We met via Facebook 3 days before this site was launched. And finally: huge retroactive credit to Nation reporter Ari Melber who we believe was the first person to publicly use the term “Meet The Facts” (with regards to this particular story) back in January. We of course thought we were being quite clever until we realized that..